Who would have thought the glorious weather we are having would have lasted longer than a week? It has certainly been a welcome break from the freezing temperatures we saw earlier this year and is expected to continue for the summer! Retailers have seen a boost to the economy since temperatures have soared; with a rise in sales of DIY goods, garden furniture and outdoor toys such as paddling pools and slides. This is no surprise really; as Britain basks in the current heat wave, there is no better time than now to get out in the garden and appreciate the great outdoors. Gardens can often be overlooked when renovating and remodelling your home, but for those lacking in space, a garden is a great way to widen your living area and provides a perfect environment for socialising and entertaining. Initially, it is important that you establish what you want to use your garden for, as this will help with your planning. Emulating the design and character of your home is also another significant element as this will help to connect the two areas. To tackle space issues, more homes are adding a garden room to their offering. These rooms are a step up from the usual garden shed or playhouse and provide a tranquil escape for the user. The room can be used for a multitude of purposes including; office space, a place to undertake hobbies (without annoying other members of the household), a guestroom or an extra play space for children. The options are endless! As a homeowner, you can tailor this room to suit your needs, requirements and tastes. As more and more people move outdoors, there has been a greater focus placed upon patios, decking and garden furniture which helps to make this space feel more homely. There are a wide range of furniture brands available, all offering individual pieces to suit different aesthetics and tastes along with household retailers providing a variety of options. 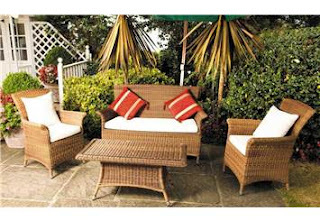 Rattan garden furniture, such as Cozy Bay, is always a popular material choice, and these pieces look great outside; providing a comfortable option for sofas, chairs and loungers which will last for summers to come. With longer days and warmer evenings, these warmer spells encourage alfresco dining. One integral piece that most British homes have within their garden is a barbeque which is dusted off as soon as the sun comes out. But why not try an outdoor kitchen? This can be as simple or as elaborate as your indoor kitchen, with the outdoor setting providing further scope for being adventurous! When the temperature does drop in the evening (this is inevitable in the UK), you may want to move into the dining room or living area. To stay connected to the outdoors, let as much natural light into these rooms; patio and bi-folding doors as well as conservatories are a great way of achieving this whilst still feeling as if you are outdoors. These great tips have been provided by the South’s leading house furnisher David Phipp; stocking top brands and lines for all rooms of the home (including the garden). Visit them in store where they can help you to cosy up your home!